Purchasing your own servers, installing Linux OS; renting a space in a data center, etc. These are all things that are related to server co-location services. The set up usually takes a week, but still the solution isn’t full proof because you have just one physical server where downtimes can occur at any time. How many times have you gotten a call telling you that your Linux box had crashed while you were travelling? The concept of co-locating your server with data centers will eventually die out one day. It’s time to switch to a new Cloud Platform. Some businesses require a dedicated server to host important web applications such as the ERP system. Eventually, most of them will have their apps hosted on a single physical server, which exposes them to a single point of failure. Imagine being able to provision a server in minutes or upgrade a server automatically. This is the idea behind the Cloud Server. Totally customisable, each Cloud Server gives you full root access to more than a dozen Linux distributions. The price depends on the size of the server you’re buying, and how much bandwidth you’ll use. For Linux distributions, every Cloud Server gets four virtual CPUs. SAS 70 Type II â€“ pertains to the managed hosting customers, Cloud Servers, Cloud Files customers and all data centers. API File Injection â€“ put a file directly into the file system so that it’s accessible inside the instance. It could be a license fileâ€”whatever you need. Separate public and private network interfaces. Private bandwidth is free and provides inter-Cloud Server communication as well as access to Cloud Files. Snapshot based server imagesâ€”scheduled or on-demand. Useful for creating “gold” images or backups. Linux distribution of your choice. Web-based console access. 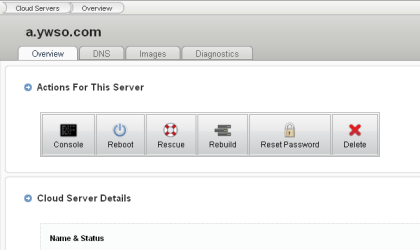 Access your server if there is a boot or network problem. Talk to Pin for more details. Pin is the author of Linux Virtual Server Setup and Guide to Online Business. Cloud Sites are designed to host general website with no more than 5,000 unique visitors a day. If you have more than 5,000 visitors to your website, we assume your requirement for disk space, bandwidth and control are increasing as well. A conventional Cloud Sites package, or most of any shared web hosting package out there have a pre defined bandwidth and space allocated. It is harder or impossible to be extended. A Cloud Servers works differently. It is like owning your own Linux Box. We have enough disk space and bandwidth to sell to you at a lower cost. Anytime your requiremnt increase, we can subscribe to more, to near unlimited. In short, if web designer has a web project with more than 5,000 visitors, then you can start considering moving your hosting to Cloud Servers. We are running the Propnet Malaysia portal. We’re about to reach the maximum bandwidth allowed in a month. Would like to know if it’s better to go for the Exabytes Unlimited Plan or their Semi-D Plan. Pls enlighten us. Thanks. Before we go any further, check this out http://intodns.com/propnet.my. Your DNS servers have some issues and you have some missing MX records too. We have reviewed Exabytes Unlimited Plan earlier (pls refer to http://goo.gl/CmkeG) and it is too good to be true. The Semu-D is nothing less than that. If you have average of 5,000 visitors a day and around RM400 a month budget, try our Cloud Server. It is a product from Rackspace and it one of the most reliable one. RM400 per month is too expensive..
What is your hosting requirement, Rojak? If it is a website, you can consider Cloud Site which is RM80 a year.